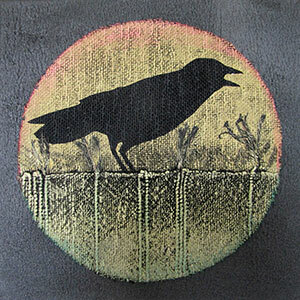 Gay Jensen is an award winning mixed media artist who paints on fabric to express her ideas, observations and emotions. She uses a wide variety of materials from fine silks, to denim from old jeans, to high tech non-wovens, to cloth she weaves herself. She applies paint with rollers, brushes, sometimes her fingers, and also uses stencils and screens she has designed. Additionally she may cut and stitch, layer and collage, quilt, embellish with beads or found objects, digitally print, or employ other surface design techniques. 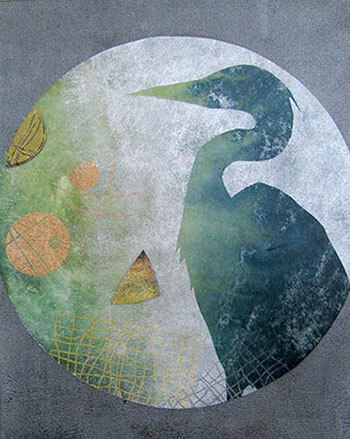 An avid bird-watcher, Gay often includes bird images in her art. Landscapes also figure prominently in her work. Recently she has been leaning more towards abstraction, especially in her new 3-D painted cloth explorations.